So this is an offshoot of another "driveline vibration" thread that was started back in 2010. 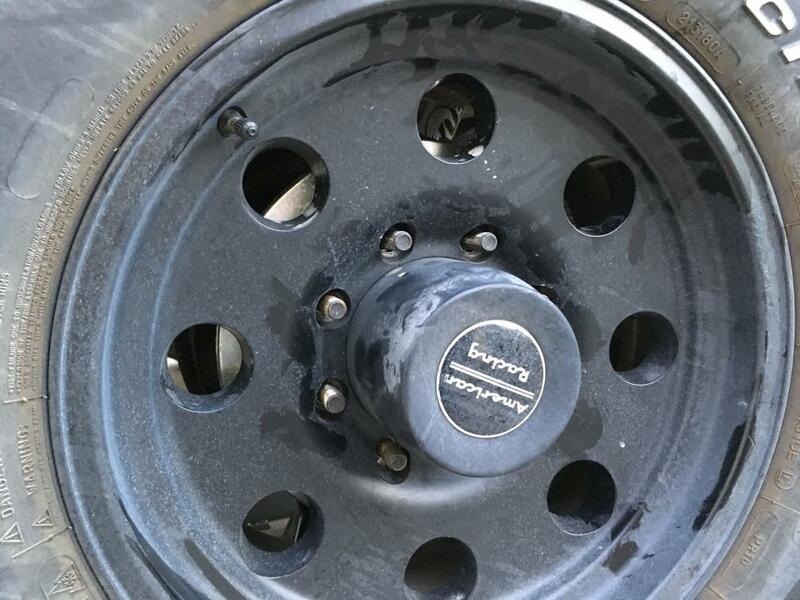 Long/short, among the items discussed on that thread as possible remedies to driveline and tire vibration was an intriguing item used primarily by over-the-road/"big rig/18-wheeler" drivers. 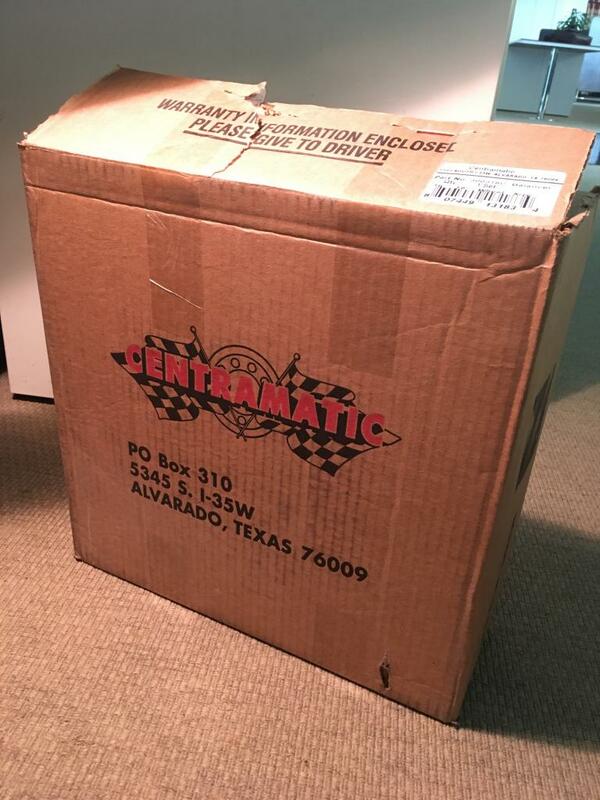 These were "dynamic wheel balancers," and are produced by a company named Centramatic. So anyway, intrigued, and having dealt with seemingly-un-fixable vibrations in my van's wheel/tire rotating assemblies (everything brand new, new axle bearings, rebuilt suspension, all new springs at all four corners, all new bushings, new Fox shocks, new wheels, new tires, new alignment, rebuilt/balanced driveshaft/u-joints, rebuilt transmission....) I went ahead recently and bought a set. At the time of this writing, $199 bought a set of 4 that were sized specifically for the Econoline. They arrived in a nice box and in good shape. The next day I went out to the driveway to bolt 'em on. 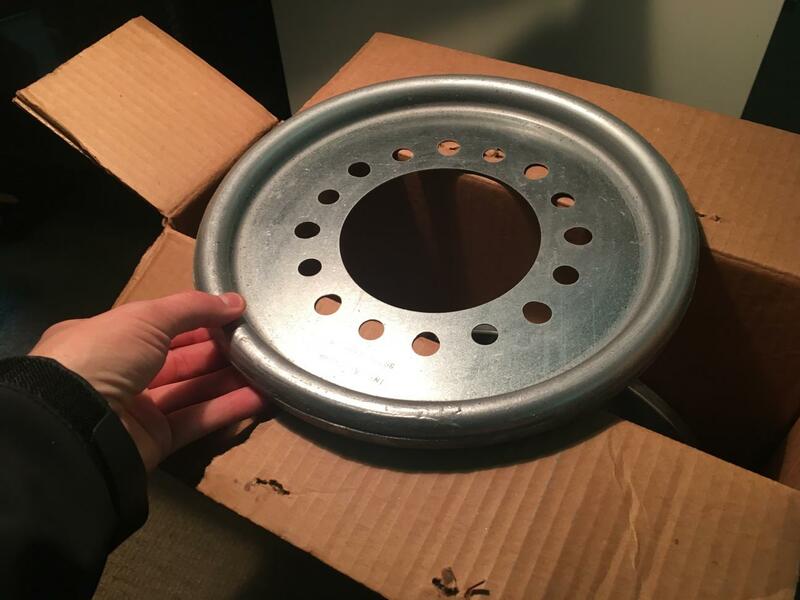 I'll keep this all as short as I can, but I figured since there's not tons of info readily available on the web about installing these on an Econoline (the Centramatic sales rep said they only sold 11 sets for E-series vans last year! ), it was worth posting pictures of how they look and fit as they install for anyone curious. First thing I did, after removing one of the rear wheels, was to place one of the Centramatic disks inside the wheel on the mounting face (where they will "sandwich" between the wheel and the brake rotor/drum.) Was curious how much room they leave for the wheel to still "breathe" through its holes and allow brake cooling. Looked like plenty of air space to me on this 17x8 Mojave rim. 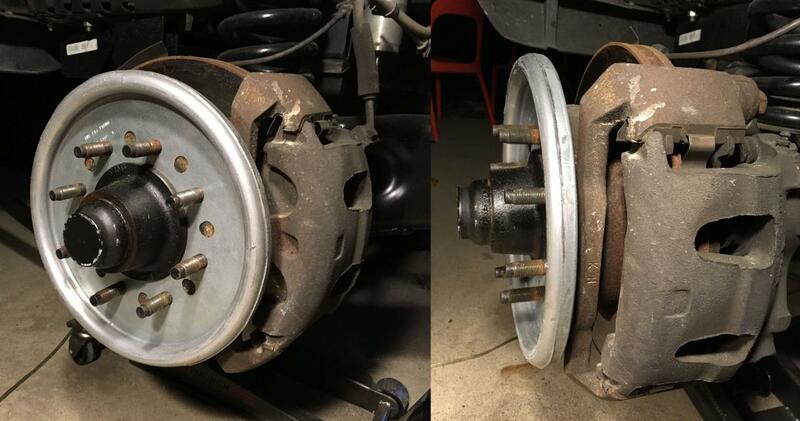 On the front axle, which of course carries disk brakes (my van is a 1995 E250 which has rear drums), there was only one way to mount the Centramatics and safely clear the brake caliper. As is visible in the photos, the clearance is pretty close, but there's definitely sufficient room. SIDE NOTE: The Centramatic rep mentioned to me that he was aware of possible clearance issues on later-model E-series vans, but he didn't elaborate if that was front or rear clearance issues. Probably worth clarifying before buying these, if your van is a newer one than mine! Everything's subjective of course (I didn't have any sort of vibration-measuring test equipment before/after), but I think these have very significantly smoothed out the ride on the freeway. I'm gonna definitely keep 'em on there and run 'em for a good while! The van just somehow feels more "solid" and "together" when running at speed on the freeway. It's not entirely vibration free (I don't think it ever will be, nor is any other car I own....) but it has (to my observation) gotten darn smooth. Glad you did the follow-up. Almost sold me. Probably going to hold off a little longer - hoping you'll slap some mud on one (front is best), let it dry, and then run it up to freeway speeds to see if they really do help out when you have wheel/tire barnacles. At first glance (in the other tread) I just assumed the housing was made of aluminum. Can you confirm that? Mike, Awesome thread, well done. And, Please don't forget to re torque the lug nuts after a few short drives. But in 4 different vans with 6 sets of tires I've yet to have drivetrain vibrations of any kind. 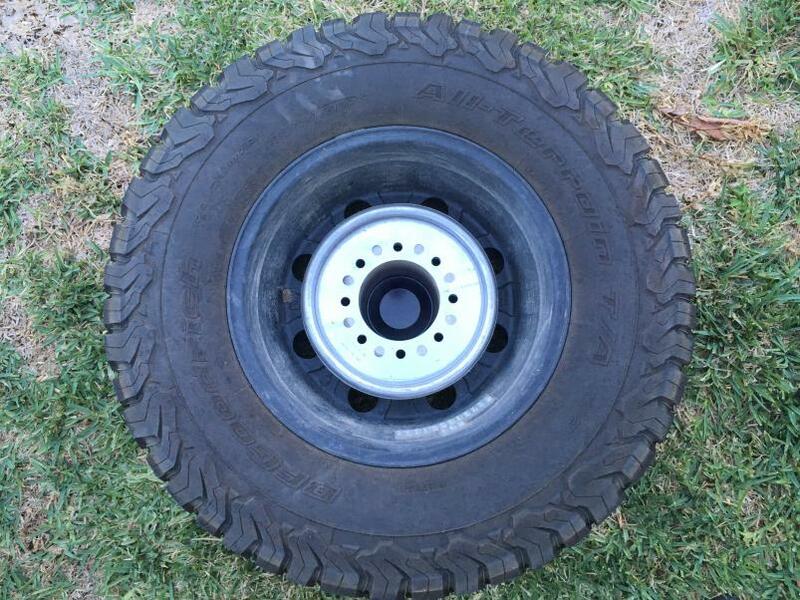 Hey, can I ask you what size tires you have run (or currently run) on your vans? My van ran totally smooth and vibration-free too originally....at least when it was running the original size 225/75R16 and also a subsequent (upsized) set of 245/75R16's. It was the move to 33" tires (after the lift kit) that was the beginning of the tire vibration issues. The construction of these is interesting. The sealed toroidal "balance weight tube" is indeed made of aluminum. But the drilled-for-wheel-studs center plate is made of stamped steel. The two components are pressed together and bonded with a heavy-duty silicone/epoxy of some sort. Ultimately they put a silver paint finish of some sort on top to somewhat unify the appearance. 265/75-16 bfg a/t currently with 47k miles.